Henry Avenue is too wide. Drivers treat it like a speedway with traffic lights, and people keep getting run over and killed along it. I've never seen it congested. Traffic flows along it, barely any stacking, and speed is a problem. There's a bridge being renovated between Monastery and Dupont; half the driving lanes have been taken out of service. The verdict? The merge movement's confusing, speed's gone down while throughput remains the same. It's like one of Marohn's spontaneous experiments. Henry's functioning less like a mini-Schuylkill and more like a street between Monastery and Dupont. More than anything else, it proves that Henry only needs two lanes. So what to do with the rest of the space? My suggestion: turn it into a busway, like the one in Ardmore. Integrate a bikeway into it as well; it'll offer a very bike-friendly resource to match the one at the bottom of the hill. Put a median between the two, and fill it with some nice tall trees. Put some proper bus stops in--more than just signposts. Make the only intersections on the busway the ones at Dupont and Leverington--that would be where the 32 exits it, and the 27 enters it. There. Now we'd have a much slower, saner, safer street; some proper bike infrastructure; and a good separated busway. And all in the footprint of today's Henry Ave.
As time goes by, ideas metastasize and further develop. 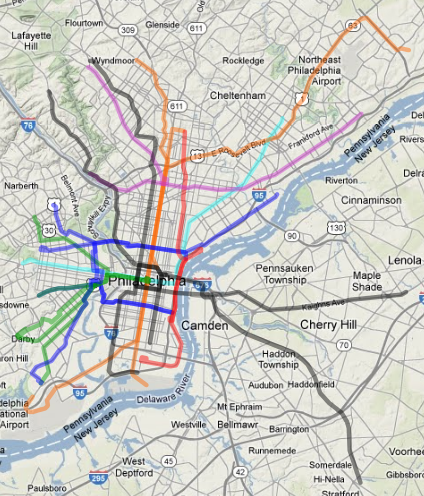 Philadelphia2050, always intended to be a model long-term transit infrastructure plan, is no different. It's not like my ideas are preserved in amber. Remember, the core point of this is not (and never has been) that this is the optimal mass-transit network for the City of Philadelphia. Rather, the point is that we need to think of mass transit infrastructure in terms of a necessary utility. SEPTA's bus network, while extremely legible (once you figure out the system core, and they don't help with that) and frequent, is hardly the optimal solution for mass transit in an urban core routinely averaging ~20,000 people per square mile. Rail solutions are the only way to further optimize service. The point of Philadelphia2050 is to describe a model of what optimized mass transit would look like for the city; to develop a model that can then be used to develop a funding scheme (à la L.A.'s 30/10, a funding scheme to develop 30 years' worth of transit in a decade). The L.A. example is especially poignant, since they, like us, never properly invested in a high-quality mass transit core, and as the PRT proved back in 1907, mass transit must be a public expenditure, a utility: it would drive any private concern to bankruptcy, but it must be provided, in order to ensure intraurban access and mobility, especially at the densities needed to maximize resource efficiency on the environmental scale. 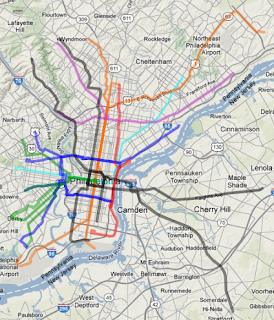 This map shows light and heavy mass transit in the City and (in heavy rail's case), across the Delaware. Pastel blue is the MFL. Orange is the BSL and constituent branches. Black is the Loop core and branches. Green is the Subway-Surface trolley system. Royal Blue is the Outer Loop and constituent branches. Red is the Delaware Avenue line and a branch via the former North Penn Branch. 1. With the Swampoodle changes proposed, there is no reason for both Chestnut Hill lines to utilize the Regional Rail tunnel. For this reason, the former Reading Chestnut Hill branch (Chestnut Hill East) is proposed to be converted to heavy rail, saving on (among other things) the cost of bringing a TBM straight up Germantown Ave.
2. The Ogontz Branch has been extended up Cheltenham Ave. to Easton Ave.: this better services upper Stenton and Ivy Hill (while the Chestnut Hill East line services the lower portions of these neighborhoods). 3. A long-term plan to extend the Chestnut Hill-Society Hill Line to the Morrestown Mall via Kaighns Ave. Prior to this happening, the Kaighns Ave. route can be developed as a "light heavy" line linking to the existing River Line way in downtown Camden. 4. Major changes have been made in the way the rail network interfaces with the Airport. Ignoring the existing (and feasible only when hell freezes over and the sun burns out) Market East proposal, the optimal HSR path to access the Airport utilizes the (ex-Reading) Chester Branch from a new junction with the NEC at Crum Lynne to the Chester Branch interchange with the NEC up by Bartram's Gardens. SEPTA can (and would) be expected to alter its routes to take advantage of this new alignment, allowing local stops in e.g. Essington, which allows the current Airport Line routing to be converted into an Airport people-mover or (better) an extended BSL terminus. 5. The Lindbergh Bvld. light rail has been extended down 84th to terminate at Eastwick Station, instead of its originally-planned Heinz terminus. 6. Light rail via Health Sciences Dr. and Civic Center Bvld. has been abandoned. Instead, Baltimore Ave. is now interlined between the existing 34 and a new Angora-Queen Village light-rail line. 7. The Washington Ave. light rail link has been moved from the Grays Ferry bridge to the 34th St. one. 8. Light rail can be added along American St. and the former North Penn Branch ROW from Northern Liberties to Fern Rock. The largest problem with the current alignment structure occurs around the La Salle campus, believe it or not. I've resisted linking Ogontz to Broad via Stenton because of its inferior La Salle access, an issue the CHE Fishers (now closed) and Wister stops do little to obviate, despite the latter's paper proximity to campus, but the Ogontz alignment, south of Olney Ave., is most definitely overkill. It occurs to me the optimal move is to find an alignment that runs through Wayne Jct. and links to Broad via Germantown. Maybe. The next-largest problem concerns utilizing 19th St. north of Girard. The distance between Broad and 33rd is 19 blocks; a more central location would thus be 22nd or 24th. Finally, it occurs to me some more light-rail crosstowns may be needed. Allegheny and Lehigh, for example, host some of the most profitable bus lines with the highest farebox-recovery ratio.